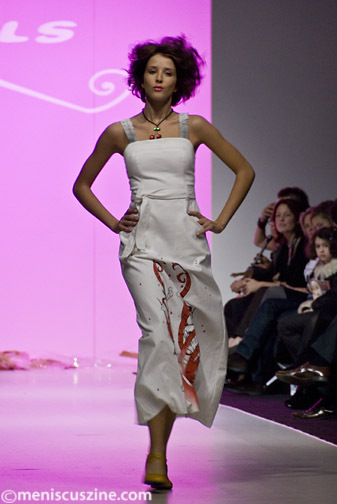 The Spring 2009 women’s collection of Damzels in This Dress comprised one half of a joint fashion show at L’Oreal Fashion Week in Toronto. The Toronto-based designer duo of Kelly Freeman and Rory Lindo shared the stage with label Playdead Cult at Nathan Phillips Square on Oct. 22, 2008. Their clothing can be found in independent stores across Canada.